Length Seaplane 37 Ft. 8 in. Length Landplane 35 Ft. 7 in. Height Seaplane 16 Ft. 0 in. Height Landplane 14 Ft. 9 in. Wingspan 53 Ft. 0 in. become the SC-1. A large biplane often described as a "three-purpose plane" - torpedo-bomber-scout - the CS/SC and its successors, the T3M, T4M, and TG, proved remarkably durable. 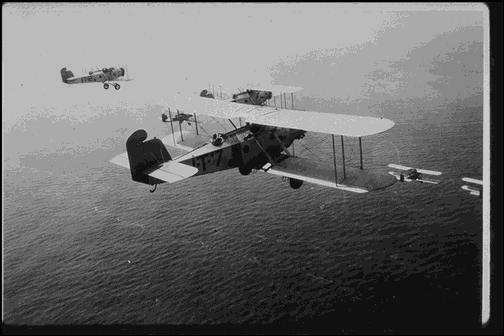 The Navy purchased 360 of them between 1924 and 1930, furnishing the heavy punch of the Navy's shipboard aviation for much of its formative decade. Of these Martin built the lion's share, 302 planes. The original Curtiss CS-1's, were powered by 525-horsepower Wright T-2 Typhoon engines. Only six were built, to be used mostly as test beds. One, fitted with a souped-up 600 horsepower Wright T-3 engine, became the prototype for an improved CS-2. Another received a geared T-3A engine and the confusing designation XSC-7. A third CS was sent to the Martin plant as a "dog ship." Since Curtiss was not willing to provide a full set of drawings and data to its competitor, this plane had to serve as a model for the SC-1. Two Curtiss CS-2's were built and set seaplane records for distance, speed, and duration in 1924, but Curtiss's price was $32,000 each. Bidding $25,200 for the CS-1 and $19,863 for the CS-2, Martin took most of the work: 35 SC-1's and 40 SC-2's were delivered in 1925-26. The SC-1 was identical to the Curtiss CS-1. The Martin SC-2 achieved only 525 horsepower from its T-3 engine; its wallowing performance earned it the nickname "Sea Cow." CS/SC series planes carried a crew of three. The pilot sat just aft of the wings, with a gunner behind him, and a "bomber" (as the Navy termed the bombardier) still further aft in a windowed radio compartment inside the fuselage. When not operating the radio, the bomber could pop his head out of a small square hatch in the top of the plane behind the gunner. He aimed the bombs or torpedoes from a ventral blister behind the torpedo, which was housed in a channel cut into the plane's belly. Martin received a third order in 1925 for a redesign. Under the new Navy designation scheme, this was the T3M-1; 24 were delivered in 1926. There were a number of changes. The T3M-1 used the Wright T-3B, which produced 575 horsepower. Using techniques developed for the MO-1, Martin engineers shifted from the riveted steel frame used in the SC to welded steel. New three-bladed propellers replaced earlier two-bladed wooden ones. Both the pilot and bomber of the T3M-1 were moved forward to sit side by side in a large cockpit forward of the wing, from which the bomber could descend to an aiming station in the nose. The gunner was moved even further aft, and a fourth crew position was established inside the fuselage beneath the gunner's ring. Besides the radio, it was equipped with a machine gun which could be fired to the rear from the ventral position. 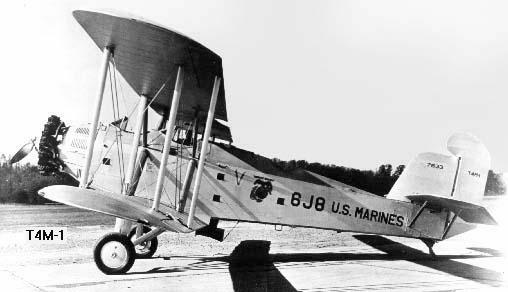 T3M-2, of which the Navy ordered an even hundred in 1926. Crew arrangement was changed again, as the removal of the T3M-1's large midships radiator left space for tandem bomber's and pilot's cockpits, the bomber occupying the forward one. The T3M-2's upper wing was lengthened to match the lower, which had been longer in the original Curtiss design. Delivered in 1927, the new models equipped Torpedo and Bombing Squadrons One and Two aboard the new carriers Lexington and Saratoga. Still not satisfied, Commander Eugene Wilson of the Bureau of Aeronautics pressured a reluctant Glenn Martin to try one of the big new air-cooled radial engines - threatening that otherwise production might be shifted back to Curtiss or to the Naval Aircraft Factory. The first T3M-2 (A-7224), redesignated T3M-3, was accordingly tested with with a Pratt and Whitney R-1690 Hornet radial. It then went to the NAF for a trial (now as the XT3M-4) of the Wright R-1750 Cyclone. The Hornet proved superior. Besides being more reliable and easier to maintain, it weighed much less than the big Packard and its cooling apparatus - reducing the gross weight of the plane by almost a ton while increasing top speed. In 1927 the Navy ordered a single XT4M-1 for flight tests, followed by a production run of 102 T4M-1's. As compared to the T3M-2, the new model's fuselage structure employed lighter chrome-molybdenum steel alloy framing; its rudder was now horn-balanced and made of duralumin, and its wings were shortened by three feet. Crew arrangement was the same, though round windows replaced square ones in the fuselage compartments. engines in 1929, followed by 32 more TG-2's with Wright Cyclones. T4M's and TG's served with the fleet well into the 1930's, the latter only being replaced in Torpedo Two aboard the Saratoga in 1937. If you have a gif or jpg of one of these aircraft I would love to have a copy for the web site. The text information is from the Glenn L. Martin Aviation Museum. Copyright © 2000NASGIVM All rights reserved.